A pilot was identified Saturday after dying in a crash. NBC 6 Reporter Darryl Forges has the story. A pilot who was killed after a small banner plane crashed into a condominium building in Fort Lauderdale was identified on Saturday. Fort Lauderdale Police identified the pilot as 28-year-old Derek Damion Morgan. The crash happened shortly before noon on Friday at the Berkley South complex at 3015 N. Ocean Boulevard. Fort Lauderdale Fire Rescue officials said the pilot of the plane was killed, but no other injuries were reported. The plane is owned by Aerial Banners, located in Hollywood. 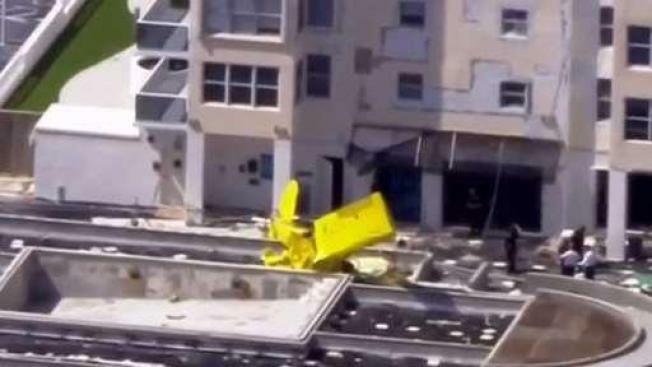 Footage showed the wreckage of the yellow banner plane on the roof of the first floor on a pool deck that was under construction. There was a large hole near the 17th floor on the east side of the building where the plane struck. An audio recording of a conversation between a pilot who saw the wreckage and a Fort Lauderdale air traffic controller was also released by officials. "The airplane looks like it's a complete loss," the pilot says in the recording. "It looks like it's on top of a parking garage. I'm right on top of it, right now, if you can mark the location." The plane was making its way northbound at about 400 feet when it took a turn westbound, straight into a residential building with people inside. The man who lives in the unit, Roger Miller, said he was heading toward the kitchen when the plane came crashing through and hit his dishwasher. "Five seconds I would've been under the dishwasher that is mangled to pieces," Miller said. NBC 6 reporter Marissa Bagg, who lives in the building, said her husband, who was home at the time, told her that the building shook and the fire alarm went off as residents evacuated. "There's a hole in the building and it looks like part of the plane is stuck in that hole," Bagg said. Construction workers were on the pool deck but none were injured. Federal investigators tell NBC 6 they plan on talking to six or seven witnesses who were inside the building at the time of the crash. According to the FAA, the plane, a Piper PA-25, took off from North Perry Airport in Pembroke Pines and was towing a banner. The FAA is investigating and the NTSB will determine the probable cause of the crash. "Our thoughts are with the pilot and his family. We are grateful that there was no further loss of life," a spokesperson for North Perry Airport said in a statement. NTSB officials say they are getting mixed accounts of what people saw and heard before the crash. "Several heard the engine with what they reported to be a normal sound. One individual reported hearing a sputtering sound from the engine," said Tim Monville, a senior air safety investigator for the NTSB. Witnesses said they saw the plane flying low, and said the banner that was being towed got snagged on another building. "That was crazy for them to be that low, coming this way with the banner hanging down. I knew it was gonna get hooked, I knew it was gonna get hooked with how low it was hanging," witness Jeff Walker said. Fort Lauderdale Police closed streets near the building for several hours before they were opened back up late Friday afternoon.